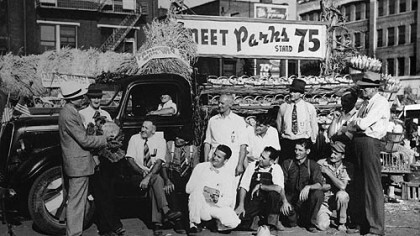 The Original Farmers Market was located on the North Side of Pittsburgh in the 1940s. Farmers markets never have been more popular, with new ones popping up every season. Yet this is how Western Pennsylvania farmers always have brought their products to market during the growing season — some of them for generations. Diane Ryglewicz has staffed a stall three nights a week at The Original Farmers Market for, well . . . forever, it seems, both at its current location on Route 50 in South Fayette and also at the old Heidelberg Raceway, where the market did business for several years in the 1970s. Before that, she and other long-time farmers in the market group, which is Pittsburgh’s oldest, set up shop three nights a week in the North Side. “It’s been since I was born, basically, going on 60 years,” she said with a weary chuckle on a recent Friday evening as the crowd flowed from stand to stand, swooning over the gorgeous displays of tomatoes, peaches and sweet corn. Mrs. Ryglewicz has been part of this for nearly two-thirds of the market’s 92-year history. The yawn she’s fighting back this steamy evening is well-earned: A little more than a hour before, she and her son, Dustin, had backed their white truck to the edge of the farm’s space in the covered pavilion, and unloaded, with weathered hands, several tables’ worth of produce from their 64-acre farm in Mercer: summer squash, zucchini, feed corn. Everything was picked fresh that morning. Carolyn McQuiston of Dawson’s Orchards had an equally early start. The hundreds of peaches she and her kids packed into boxes were plucked off trees in her family’s orchard in Lawrence County’s Enon Valley just a few hours before, because to offer her customers days-old fruit would be unthinkable. Not to mention the variety, which changes weekly as the different crops come in. Many customers make a night of it, grabbing something to eat or drink at one of the picnic tables after filling their bags with produce. The lines are especially long at the Country Style Pizza booth, where “Fry Guy” Steve Heins cranks out basket after basket of hand-cut french fries. On a typical Friday, in three hours, he’ll go through 50 pounds of potatoes. The market plows ahead regardless of weather, thanks to the cavernous roof — a rarity among the region’s 120-plus farmers markets. Yet it’s rooted in tradition. When the forebears of The Original Farmers Market set up shop a century ago on the sloping bank of the Monongahela Wharf, Downtown, they, too, enjoyed covered selling space. Though getting to that city-owned market was more of a hassle: in 1919, when the group incorporated as the Allegheny County Fruit & Vegetable Growers Association, “going to market” involved hitching a wagon to a horse and negotiating the hilly terrain on the other side of the river. Mrs. Ryglewicz’s father, Louis Orient, who owned a farm in Blairsville, was among the hundreds of vegetable, fruit and poultry farmers who sold along the Mon in the ’20s and ’30s, when warehouse-lined Water Street was the cobblestoned center of Pittsburgh’s maritime traffic. When the city shut the market down in 1938, he and the others — calling themselves The Original Farmers Market — leased space in a parking lot at the corner of West Robinson and Lacock streets in the North Side. Louis Orient would serve as president of the group for four decades. For the farmers, the market always has been a family affair, with parents and grandparents working alongside cousins, siblings and uncles and aunts. One of Mrs. Ryglewicz’s earliest memories is of selling flowers on the North Side for 50 cents a bunch, while her grandmother watched from a stand across the aisle. She was 4. “Francis the Cop would help me make change,” she recalled with a chuckle. Sonny Janoski of Janoski’s Farm in Clinton, who jokes he started going to market when he was “still in the womb,” learned to make change when he was a kid, too. His parents, Anna and Michael, had a farm in Mt. Lebanon, and everyone was expected to pitch in. Back then, the market boasted more than 400 members and was open year-round. The biggest crowds — 4,000 to 5,000 on an average night and up to 12,000 on “special paydays” and Fridays — came during July and August, as the summer crops ripened. The opening bell sounded promptly at 6:30 p.m., but things didn’t really get hopping until after 9. No one was sure if the crowds would follow when construction of Three Rivers Stadium forced a move to Heidelberg Raceway in Scott. 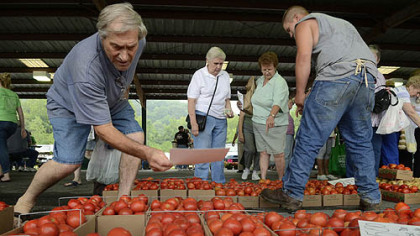 They did, even if some of its farmers did not, opting instead to open a competing market in McKees Rocks. Another move in 1978 to today’s location near Cecil also couldn’t keep the crowds away; after a “lull” in the early 2000s, the market is busier than ever, said Mr. Janoski, whose farm has the largest stall — a whopping 90 feet long. “When Sonny wants to display something, it’s not two rows. It’s five,” said his daughter-in-law Patty Janoski, laughing. As market president since 1980, it’s Mr. Janoski’s job to sound the electric siren that announces the start of business at exactly 5:30 p.m. And make no mistake, people are anxiously jockeying in position, usually with dollar bills in their outstretched fists. No vendor will sell you a thing before that siren, which has been part of the market since its North Side days, goes off. Though the market officially opens in May with a bounty of spring greens, it doesn’t become a “real” farmers market until corn and tomatoes arrive in mid July, says Mr. Janoski. It runs through Thanksgiving. Buying habits have changed dramatically since the early days of the market. Mrs. McQuiston remembers her parents, George and Janet Dawson, selling peaches by the bushel. Now, it’s small baskets, “because people don’t can or freeze” like they used to. Same with the tomato crop from Janoski’s, which used to arrive by the truckloads. “Younger people, they don’t have the time, especially if two people are working in the family,” said Mr. Janoski’s wife, JoAnn, who also comes from a farming family. Stop by the market in September, though, and you’ll see bushel baskets of peppers and tomatoes set aside for the old-timers who still like to put things up. Also new are all the different accents among shoppers, reflecting Pittsburgh growing cultural diversity. Regulars include Sophia Bralj of Castle Shannon, who grew up in Yugoslavia. “It’s fresh, and it’s cheaper,” she said, showing bags laden with lettuce, cukes, peppers and kohlrabi. What hasn’t changed is how much time and effort the farmers put in during the season. “We’re committed. It’s not like you can call in sick, or take the night off,” said Mrs. McQuiston, even to have a baby. Her daughter, Karen, is a prime example. She was induced so everyone could make it to market the day before. We ate this for breakfast. And after lunch (husband). And before dinner (me). Enough said? Heat oven to 400 degrees. Mix 1/2 cup sugar, cornstarch and cinnamon in a saucepan. Stir in peaches and lemon juice. Cook, stirring constantly, until mixture thickens and boils. Boil and stir 1 minute. Pour into ungreased 8-by-8-inch pan; keep mixture hot in oven. Cut shortening into flour. Add remaining 1 tablespoon sugar, baking powder and salt and mix until mixture resembles fine crumbs. Stir in milk. 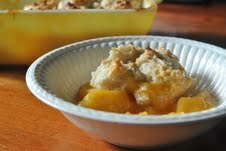 Drop dough by spoonfuls onto hot peach mixture. Bake until golden brown, 25 to 30 minutes. Serve warm, if desired, with whipped cream or vanilla ice cream. This bright and tangy salad dressing is terrific on salad greens, but you also could spoon it onto grilled chicken. Peel and pit peach, and cut into chunks. Place with remaining dressing ingredients in a food processor or high-powered blender and puree until smooth. 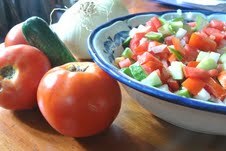 Add ingredients to a large bowl, and toss together. Salt and pepper to taste. Chill and serve.Serves 4. Prepare corn as you would to eat it off the cob. The Janoski crew brings the water to a full rolling boil, adds the corn and then turns the burner off; leave the corn in for no more than 10 minutes. Melt the butter in a electric skillet. (I used a cast-iron skillet.) Toss in onion and allow to partially cook, about 3 to 4 minutes. 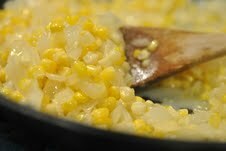 Cut the corn kernels off the cob and throw into the onion-butter mixture. Allow to brown up nice, about 2 to 3 minutes.